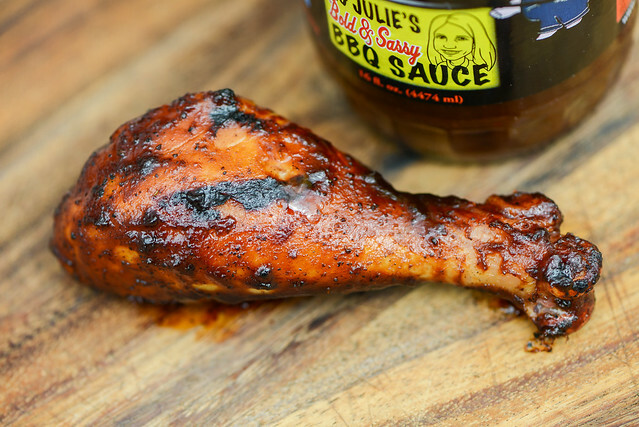 With a well spiced tangy profile that gains extra sweetness over the fire, Big Julie's Bold and Sassy BBQ Sauce is built to do right by you in many different applications. Matt Shaffer—who currently helms Shaffer's BBQ—has a family whose roots run deep in barbecue in the Shenandoah Valley. His grandfather started slinging barbecue chicken under the name The Chicken Palace at local festivals starting back in 1956. Then in the 1970's, Matt's father, George, took over the barbecue business, keeping up their festival presence as well as doing catering. Now Matt has returned to Winchester, VA to a continue the mobile barbecue tradition with his food truck. 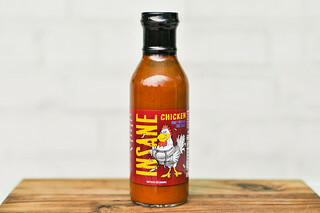 Along with smoking meats, he has developed a line of products that include two sauces and a rub that are available online. The initial whiff of this sauce smells like a big bowl of chili-spiked cider vinegar. It's incredibly tart, but there's a bit of sweetness behind that tang that comes with the fruity aroma of tomato ketchup and a hint of molasses. The seasoning smells diverse and complex—it includes garlic, chili, and herbal notes. This glossy, smooth sauce is semi-transparent, making is easy to see the tons of black, red, and white specs of spices peppered throughout. It has a maroon hue and medium-thin consistency the falls in a fast and steady pour from a spoon. The majority of the sauce releases from the silverware quickly, but after a few final drops, there's a thin, heavily spiced coating left clinging. For the pretty strong aroma and well spiced appearance, the first taste of this sauce is oddly neutral. It takes a few seconds on the tongue before a very mellow ketchup-y sweetness comes out, which is quickly drown out by a strong vinegar tang. There's a mellow molasses depth in this initial stage, but that becomes overpowered by the spices that give the sauce increased complexity the longer it sits on the tongue. First comes a mix of garlic and herbs, shortly followed by an earthy heat that builds, along with the vinegar, to leave a final spicy and tart aftertaste. The sauce coated the chicken in a thin, even layer that baked down very well, building up to a respectable coating after multiple brushings over indirect heat. When moved to direct heat, there was minimal burn off along with light caramelization. The flavor held up exceptionally over the fire. The hearty chili flavor remained in tact while the sugar and molasses components gained more prominence. This gave the final product an even more balanced profile in the end that made for a damn tasty piece of chicken. 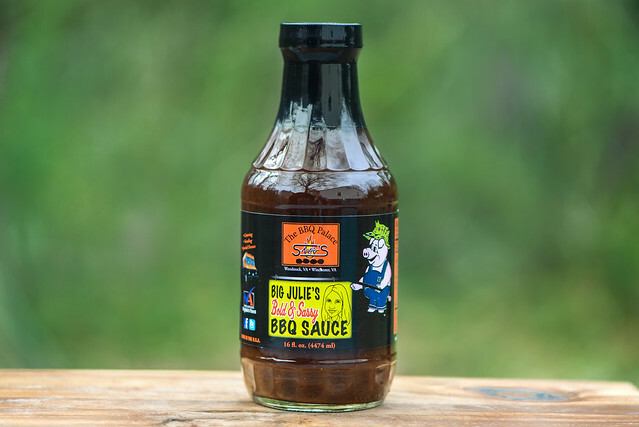 I love a sauce that has the ability to work well on multiple levels, and Big Julie's Bold and Sassy BBQ from Shaffer's BBQ does just that. 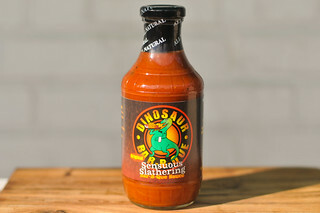 Out of the jar the sauce is thin and tangy, with a great spice and mild sweetness that gives it an excellent depth. Its consistancy and flavor make it an easy choice to dress a pile of pulled pork. But then over the heat the sauce transforms to be thicker and slightly sweeter, while retaining the all the spice nuances from out the jar. 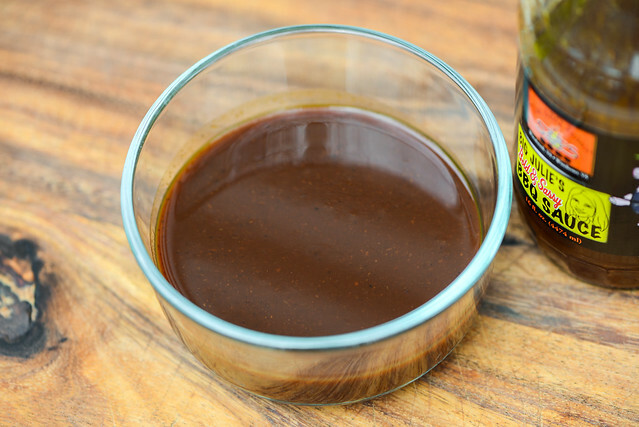 This made it work wonders on my chicken, and I imagine it would be just as good on pork chops, rack of ribs, and a whole lot more. It feels like a sauce made to do good things on smoked meats no matter the animal or if it's applied during or after cooking. Y'all can give Matt a big thanks, because he sent along two bottles of sauce so I could give one away to you. 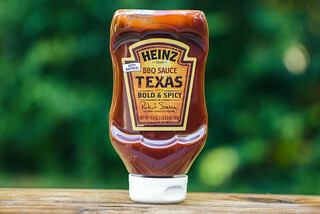 If you'd like to try this excellent sauce yourself, all you have to do is comment on this post with what you're most excited to grill or smoke this spring. Deadline for entries is 11:59pm on Tuesday April 26, 2016. Read the official rules for more details. One entry only per individual. Good luck! Going to attack a full brisket for the first time in almost 10 years. Excited and nervous all at the same time. I'm really excited about smoking lots of finger foods to enjoy by the pool...ribs, wings, jalape�os, sausage, et cetera. My wife loves tacos al pastor, so it'll be a big batch of that. For me? Brisket. Really looking forward to trying out Texas-style ribs. After starting out KC style, I've recently visited Austin and surprisingly discovered that I enjoyed the ribs quite a bit. So I'm going to work on that - keep the sweet down and carefully select just a few spices (probably just S&P). Brisket, ribs, some sort of sausage. I'm really excited about grilling chicken! I'm always ready for grilling spicy chicken wings. I am most excited to grill rope sausage. Whenever I fire up the grill, no matter what I am cooking, I always add rope sausage. I'm looking forward to smoking cheese this Spring! What won't we grill?! Haha! Along with brisket, steaks, brats, chicken... I made up some Filipino sausage I can't wait to try on the grill for the first time!